Can quality components make up for this laptop's shortcomings? If you want a system for general computing and light gaming and you'd rather concentrate on processing power, this machine is an ideal buy thanks to the combination of an AMD APU and discrete graphics core. If screen quality or battery life are more important, though, look elsewhere. Toshiba is a reliable choice if you're looking for a solid mid-range laptop, and the S50D-A-10G aims to continue that tradition with a tempting price of £480 (around US$820, AUD$870). At this end of the market, there's an interesting battle going on between Intel and AMD: while many systems still make do with Intel Core-branded chips, more than ever rely on AMD's APUs. The S50D is one such machine. It's powered by an A10-5745M, which is the most potent APU that AMD currently puts inside laptops. It's got four cores, and each of those uses the Piledriver architecture – the same design that's found inside AMD's full-fat desktop processors. Those four cores run at 2.1GHz, and they'll hit a peak of 2.9GHz using Turbo mode. APUs usually impress thanks to integrated Radeon graphics cores, but Toshiba has gone one step further with this machine: instead of relying on the Radeon HD 8610G core, it's fitted an HD 8550M discrete GPU. The discrete chip and the integrated core both have 384 stream processors, with the HD 8550M clocked to 650MHz – a little faster than the 626MHz top speed of the HD 8610G. When more graphics power is needed, both cores can work together to deliver more grunt than the APU provides on its own. This isn't the only recent system that's arrived with an AMD APU inside. The HP Pavilion TouchSmart 15-n070sa used an AMD chip from the ultra-mobile Kabini range, and Toshiba's own C50D-A-13G also deployed Kabini silicon. Another Toshiba rival, the M50-A-11C, relies on Intel Core i5 hardware, and a left-field competitor comes from Lenovo: its IdeaPad Yoga 2 11 is an affordable hybrid device that uses an Intel Pentium processor. The S50D looks strong with that AMD APU inside, but the rest of its specification isn't as enticing. 8GB of RAM is what we expect from mid-range machines these days, and the 1TB hard disk has plenty of space – but its 5,400rpm spindle speed suggests poor performance. The screen's 15.6-inch diagonal is decent, but the 1,366 x 768 resolution is low – and it's not a touchscreen, either. At least there's a DVD writer, which is often omitted from laptops. There's little to shout about on the connectivity front. Bluetooth 4.0 is another standard inclusion, but the Ethernet connection isn't Gigabit, and the 802.11n Wi-Fi is single-band. Around the edges are two USB 3.0 ports, a USB 2.0 connection, HDMI and D-SUB outputs, an SDXC card reader and two headphone jacks – a standard load-out. The exterior is typical Toshiba. It's mostly plastic, with a thin layer of aluminium used across the wrist-rest and to coat the back of the lid, and glossy black elsewhere – so it can't be accused of being ugly, but it's not going to draw any admiring glances either. Build quality is mixed; the wrist-rest didn't move much when depressed, but the plastic underside feels weaker – and the middle of the screen is similarly flimsy. We'd advise slipping the S50D inside a case before it leaves the house. 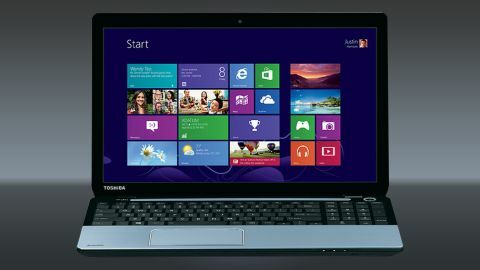 The 2.38kg weight and 24mm-thick body aren't impressive, either; this machine is thicker and heavier than three of its rivals, with only the Toshiba Satellite C50 proving chunkier. The Scrabble-tile keyboard is made from glossy plastic, and it has a good layout. Toshiba has found room on the wide S50D to fit a numberpad, and most of the keys are large enough, with big backspace and shift keys and a double-height Return button – we'd only quibble about the tiny spacebar. Quality is serviceable, too. The keys don't have enough travel, but that's not a huge problem: they're heavy and consistent enough to provide solid feedback without feeling too weighty, and the base is strong. We quickly got up to speed – an improvement on most of the other systems mentioned here, which combined low-travel keys with flimsy bases. Little stands out about the trackpad – its surface is fine and the two buttons are light and clicky, although they feel a little too cheap for our tastes.